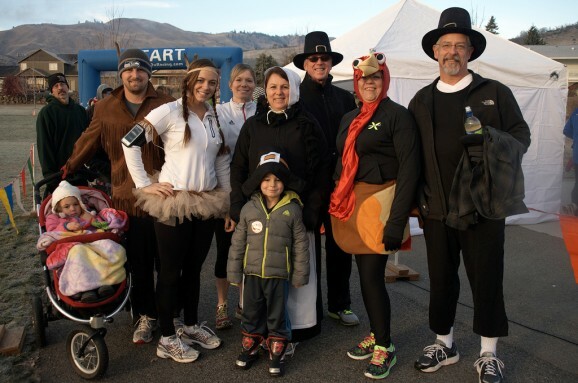 Runners don costumes for the 2013 Turkey on the Run in Wenatchee. WENATCHEE — Several years ago, the Women’s Resource Center would subsidize shortages in its food bank with reserve funds and from other sources. Money that came from the Regional Support Network for beds at the Bruce Hotel dried up, forcing the Wenatchee-based center to plug the gap with money that previously went toward the food bank. In addition, donations from the local community and from such groups as Northwest Harvest and Second Harvest are down from previous years. Runners and walkers pack Woodward Street during the 2013 Turkey on the Run. When the food runs out each Tuesday, it runs out. As many as 30 families walk away empty handed each week. “We don’t have that extra money for the food bank, which means we have to turn people away,” said WRC board member Sara Deason. For the past several years, RunWenatchee has donated proceeds from its annual Turkey on the Run event to the Women’s Resource Center. It also asks participants to bring non-perishable foods to the race. Last year, the event raised about $2,800 in cash and more than a ton of food items. The goal for this year’s Thanksgiving Day race at Rotary Park is to increase that amount to $3,500 and 1.5 tons of food. Demand for food remains strong at the Women’s Resource Center, which serves women, men and children from Chelan, Douglas, Okanogan, Grant and Adams counties. During the past three months, WRC has served more than 1,000 children ages newborn to 2, more than 4,000 children ages 3 to 18, more than 5,000 adults ages 19 to 54, and more than 2,500 adults ages 55 and older. As it has since its inception in 2008, this year’s Turkey on the Run will begin at 9 a.m. and will feature 12K and 5K runs/walks and a short kids race. The 12K and 5K will be chip-timed. The first 800 paid registrants will receive high-performance beanies. The race is presented by Biosports Physical Therapy of Wenatchee. The 2013 Turkey on the Run attracted more than 930 participants, compared with 680 the previous year and 400 in 2011. For many runners and walkers — along with their family members and friends — it has become a must-do event. 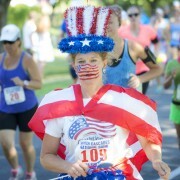 In the spirit of the holiday, many participants dress in costumes. Turkey on the Run also serves as the fall finale for the Columbia Valley Girls On The Run program. This year, more than 100 local girls, ages 8 to 12, will run in their first 5K. Each girl will have an adult running buddy to guide them through their journey of health and fitness. Packet pickup will be held from 4 to 6 p.m., Wednesday, Nov. 26, at Pybus Public Market in Wenatchee; and again from 7:30 to 8:55 a.m., Thursday, Nov. 27, at Rotary Park. Besides Biosports, other 2014 sponsors include Arlberg Sports, Orchard Bar and Caffe Mela.